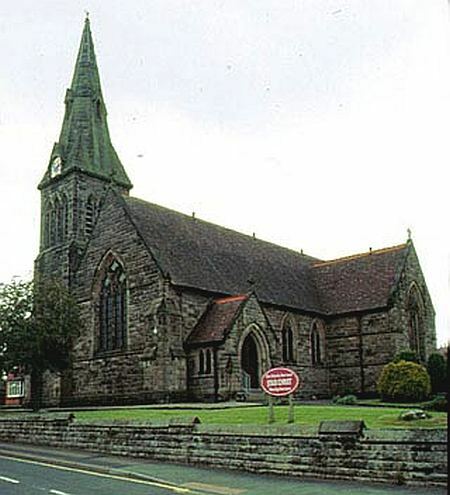 This large gothic chapel (which replaced the former chapel erected in 1810) was designed by local architect John Rogers of Prees and the builder was John Stringer of Sandbach. The chapel was built in 1877-9 at a cost of over £5000. Tenders were invited in September 1877. The foundation stones were laid on 25th October 1877. A bottle was placed among the foundation stones which contained copies of the Watchman and the Recorder, the Whitchurch Herald, a circuit plan, a list of trustees and the names of those laying the foundation stones. The chapel was dedicated at the opening services on 24th April 1879. This chapel has a nave and transept, and a clock tower with a spire 100 ft. high. Three fine stained glass windows were inserted in the chancel, made by John Davies of Wyle Cop, Shrewsbury. It is still in use as a Methodist chapel in 2017.